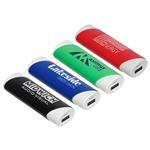 The Trim Slim Power Bank with your promotional logo and a powerful UL listed battery. One Micro USB in port with two regular USB OUT port. 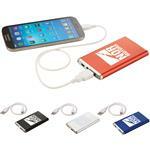 Unique built-in micro to regular USB cord. LED light indicates battery/charging status. 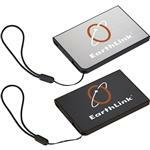 UL certified Lithium- Polymer Ion battery. On/Off button. Plastic exterior. 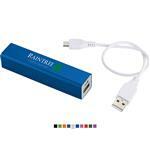 One of our best selling power banks! Production Times Available: 5 working days. Inquire for rush.